A boat propeller accident can happen in a split-second, causing death or lifelong injuries. Many victims were sitting or standing near the stern of the boat above the gunwale or transom, when the boat operator pushed the throttle forward. Others were simply relaxing, or about to jump out onto their jet ski. When the boat operator lunges the vessel forward passengers can fall overboard and into the water off the backend of the boat. The propeller on any motorized water vessel often resides under the water line, making it invisible to the boat operator, skier, swimmer or passengers. 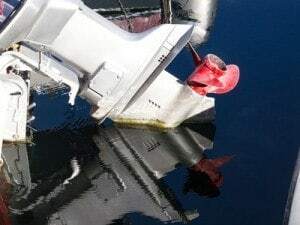 Many victims of Illinois boat propeller accidents lose limbs, suffer significant severe lacerations, or experience serious internal injuries or facial disfigurement. Many of the injuries cause permanent disability. Many times, a propeller strike event will involve a crew, operator or passenger overboard incident. The operator should immediately turn the boat toward the individual in the water, while simultaneously shifting the engine into neutral. This pushes the stern of the boat in the opposite direction, while stopping the boat prop from spinning. A circle of death strike event often occurs when the boat operator loses steering control and/or goes overboard. Nearly all propellers on inboard (I/O) and outboard engines are designed to spin clockwise automatically. The prop pitch produces a “prop walk,” that will cause the watercraft to circle if steering is lost while the throttle is still applied. Unfortunately, this circling action increases the chance of a catastrophic scenario because the boat operator after falling in the water can be run over by the vessel and injured by the propeller. Reckless Steering – Many times reckless steering causes a passenger to fall into the water over the transom and into the spinning blades of the propeller. Falling – When passengers fall in to someone or their pushed over the stern and into the blades of the propeller. Revving the Throttle – Individuals in the water can suffer injuries caused by a propeller when the throttle is revved. Operator Inexperience – Severe propeller accidents can occur when operators forget to wear the cutoff switch lanyard that shuts the engine off automatically. The accident is usually made worse when the operator is inexperienced in how to shut the engine off quickly during times of emergency. Tripping – If a boat passenger trips over the tiller they can easily fall overboard and into the moving propeller blades of the outboard engine. Improper Boating – Inexperienced can cause propeller accidents when a safe distance is not maintain from “diver down” flags in inlets, navigational channels and rivers. Another improper boating procedure includes allowing individuals near the prop or stern when launching or ungrounding the boat. Unsafe Boating Practice – Passengers and swimmers allowed onto a slippery swim platform can become victims of prop accidents when the engine is in gear. Other unsafe practices include reversing the engine when a water skier, diver or swimmer is behind the boat, or putting the engine in gear before first confirming that every passenger is back on the boat. Poor Water-Activity Procedures – Water skiers often become victims of prop accidents when the boat operator runs them over while circling back for a pickup without first cutting off the engine. Additionally, gunning the engine without first looking back to ensure that no one is swimming or floating behind the boat increases the potential of prop accidents. Even when the propeller is not moving and the engine is off or idle, the propeller blades are extremely sharp and very dangerous. If you, or loved ones, have been seriously injured in a propeller accident, or you have lost someone from a boat propeller fatalities you are likely entitled to obtain financial compensation. Rosenfeld Injury Lawyers LLC at (888) 424-5757 offer a free, no obligation consultation to offer legal advice on the best way to proceed with an Illinois boat injury case.